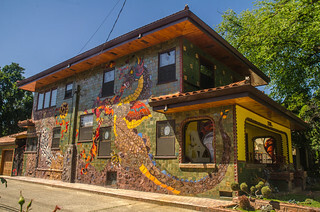 Created by local art teacher Raymond Gage for the Belmore Family in a quiet neighborhood of Sacramento around 1985, the "Dragon House" has a complete fantasy design, with murals, a sculptured front garden, and even lamp poles made of fairies, warriors, and dragons. Most dramatic however is a large mosaic of a (Western) dragon fighting a white tiger, a popular (Eastern) Buddhist symbol. In case people wonder of the origin of this popular motif, in Buddhist/Taoist scripture (pretty synonymous in China) the tiger is an aggressive grounded animal, while the dragon is a wise and tactical aerial animal. Their skills then cancel each other out in conflict, suggesting some complementation of their disparate skills and reflecting a great cosmic balance.